Congratulations to Rachel Griffin who, following interviews held in the school, has been selected to be the Kilsyth Civic Queen, for 2016. Also successful at interview were her Ladies-in-Waiting, Aimee Paterson and Katie McDowall. We wish the three girls every success in these important and exciting roles. A staff-pupil Volleyball match took place at the end of last week and the proceeds, nearly £50, will be added to pupil charities. The staff won by 26-22. Pupils in S4, S5 and S6 have been given opportunities to register to vote, over the past couple of weeks. The final opportunity, mainly for S4, will be on Thursday 31st March, during Tutor Time. Many SQA practical examinations are already underway. These are marked by a mixture of school staff and SQA examiners and contribute to final course awards. We wish the pupils every success – most have worked very hard for these final assessments. Pupils who have applied to attend Easter School should have received their joining instructions for the four days. Only those who have actually applied for Easter School can attend the tutorials, or use the transport provided. Any other pupils who wish to attend can take part in the supervised study facility. Immediately after the holiday, from Monday 18th until Friday 29th April, S3 pupils will be undertaking extended assessments in all their subjects, during class time. The style of assessment will vary from subject to subject and pupils will have no more than two assessments/day. Friday 1st April will be a non-uniform day, with the proceeds going to pupil charities and pupil activities. It costs £1.00 to participate. The school will close on Friday 1st April, at 2.30 p.m. for the two-week holiday, re-opening on Monday 18th April. Study Leave, for S4, S5 and S6 pupils sitting SQA examinations, will be from 3rd May until 3rd June (both dates inclusive). Pupils who have no examinations will not have Study Leave and will be expected to attend school, during this time. A group of senior pupils is running a fundraising Race Night, in aid of Comfort Rwanda and Congo, on Thursday 24th March, at 7.00 p.m., in the school. Tickets are now on sale, priced £5.00, and can be obtained from Reception. We would also be very grateful to receive raffle prizes. Information has been issued to pupils in S4, S5 and S6, regarding our Easter School, which will run from Monday 4th April until Thursday 7th April. We would encourage all those who will be sitting SQA exams to take advantage of this opportunity to attend subject tutorials and to study in a quiet environment. All returns must be made by Tuesday 22nd March, so final arrangements, including transport, can be put in place. Last week was S2 Numeracy Week, which got underway with the Maths department celebrating Pi Day on Monday 14th March (3.14). During the week, the pupils have participated in a treasure hunt, solving subject related numeracy problems, around the entire school. S2 have also kept diaries of all the numeracy they have encountered in their various subjects. 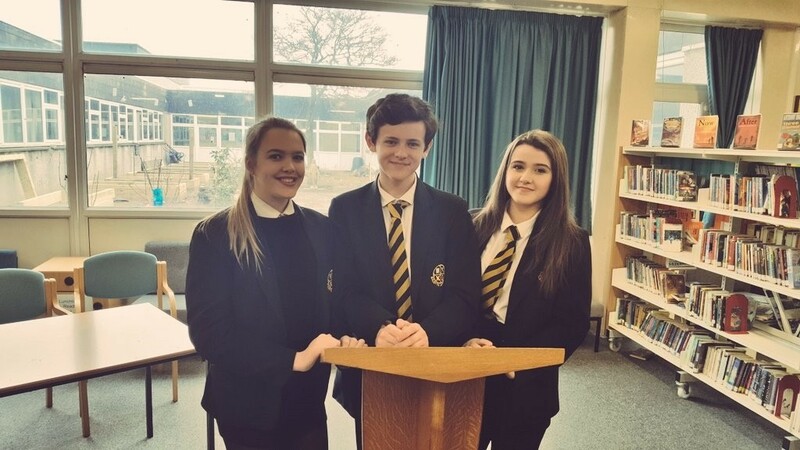 Congratulations to Ben McDowall, Kirsty Imrie and Megan Shaw (all S3), who have qualified for the North Lanarkshire finals of the ‘Speak Up’ public speaking competition. The final will take place on 1st April and we wish the team every success. Sixteen pupils ranging from S2-S6 took part in a very enjoyable workshop delivered by three professional dancers from the Y-Dance company. They spent five hours learning hip-hop and contemporary routines and were also given the opportunity to be filmed for a promotional video for the company. The feedback from the dance tutors was very complimentary, praising the hard work and ability of the dancers involved. In December, Holly McArthur represented Scottish schools at the international pentathlon and came 4th, her first major competition since returning from an 8-month injury. During the indoor season, Holly also won Scottish under-17 titles for the 300m and pentathlon. Last weekend, Holly competed at UK level, in Sheffield, where she won a silver medal, in a very competitive field. Well done on this excellent performance. The school will be closed on Friday 25th and Monday 28th March, which is Easter weekend. We return for four days and will then close on Friday 1st April, at 2.30 p.m., for the two-week holiday, re-opening on Monday 18th April. We were, once again, delighted to host the annual Rotary Club Young Technologist competition. 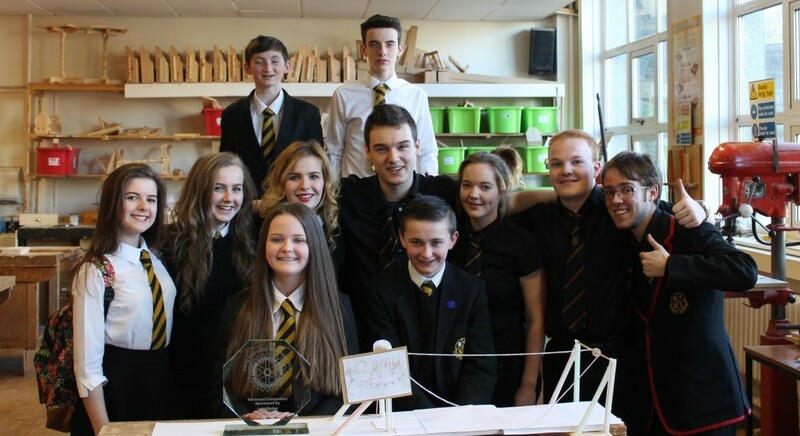 There was a great turnout of teams from all over Lanarkshire and each one had to work on a bridge design. The winners of the junior competition were from St Maurice’s High School, the team from Cumbernauld Academy won the intermediate category and Kilsyth Academy, represented by Angus Buck, Calum Baird, Josh Wood and Dara Brown, were the winners in the senior event. Well done! All pupils have been issued with a copy of the Head Teacher’s Newsletter, which contains information about a number of school events and about the forthcoming SQA examinations. 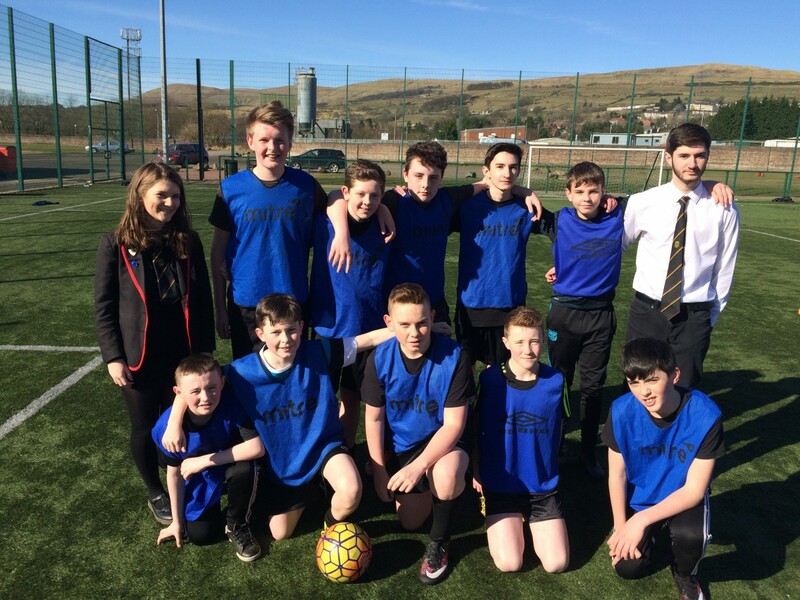 The inter-House football tournament, for S1/2, took place last week. The teams all played very well but the tournament was won convincingly by Antonine House, with Colzium in second place, Balmalloch third and Dumbreck fourth. Well done to everyone who participated. The North Lanarkshire Cross Country championships were held last week, at Airdrie Sports Centre. All the runners performed well and the S1 boys’ team finished in third place. Congratulations on winning bronze medals! Pupils studying Higher Geography took part in a field trip last week, as part of their SQA assignment. The group looked at urban land use is and around the city of Glasgow and this will now form the basis of their write-ups back in class. The school will be closed on Friday 25th and Monday 28th March, which is Easter weekend. We will then close on Friday 1st April, for the two-week holiday, and re-open on Monday 18th April. On Wednesday 9th March, there will be an Options Information Evening for parents of pupils who will be entering next year’s S5 and S6. This will also incorporate advice about Higher Education and considerations that have to be borne in mind, when choosing subjects. The evening will begin at 7.00 p.m.
S2 Tracking Reports will be issued on Tuesday 8th March and this will be followed by a Parents’ Meeting on Tuesday 15th March, from 4.15 – 6.45 p.m. Thereafter, S2 option sheets should be returned by Friday 18th March. All S4 pupils have been participating in the Youth and Philanthropy Initiative, over the last few months. This has focused on social enterprise projects, engaging with local charities and preparing a pitch to win their charity £3000. Each class held heats and the charities in the final were CACE, Merklands School, Broadwood Amateur Boxing Club, Chris’s House and Hope for Autism. 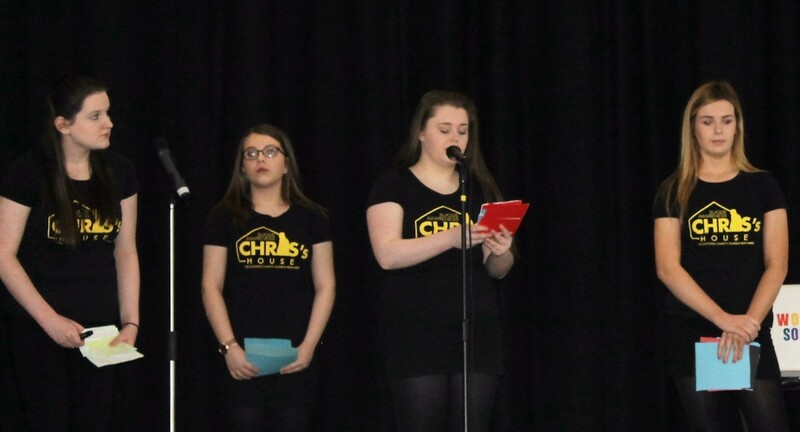 The presentations were excellent and the winners were Chris’s House, which is based in Airdrie and provides 24 hour support and counselling for potential suicide victims. The pupils in the winning team were Lucy Laggan, Katie McDowall, Aimee Paterson and Robyn Shaw. The girls gave an outstanding and creative presentation and showed real passion for their chosen charity. Well done to everyone who took part – the standard was extremely high – and a special congratulations to the winners.